John Talbott's Paris: l’Ecallier du Bistrot - 1 thumb up - 1 down - I cannot believe I’ve never written this place up. 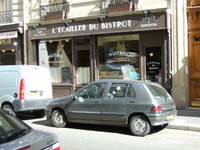 l’Ecallier du Bistrot - 1 thumb up - 1 down - I cannot believe I’ve never written this place up. I was blown away; wow, what huge, tasty things. Since then, I’ve been by several times for a few oysters and white wine before lunch and a few times for the full Monty. The four of us from the 18th, innocents we, decided after our blow-out, one-star meal in Aulnay yesterday, to have the simplest of meals – simple grilled fish with no fancy, no sauce, no nuttin. And indeed we did. The oysters and bulots (with mayo) were quite good but the fish mains were blah, plain, so what? We had 1 scallop dish (overcooked), 1 plaice, 1 sole (only slightly rubbery) and 1 barbue. We ended with a Paris-Brest that was equally so what. The bill with coffee, wine but no bottled water was 96.25 € a couple. Go? Yes for the oysters and white wine. No for the fish. You was blown away wow, what huge, tasty things. Since then, you’ve been by several times for a few oysters and white wine before lunch and a few times for the full Monty.